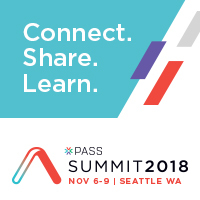 Today is the day that I have the privilege of announcing the PASS Summit 2018 Speaker Idol contestants. The contestants have been grouped into three groups, with each of groups presenting on either Wednesday, Thursday or Friday. The winners of these three days will then be presenting again in the finals on Friday afternoon at 3:30 pm along with one runner-up. Each of these 12 attendees to going to get some great feedback from our panel of judges (which I’ll announce later). I wish everyone luck, and all see you at the PASS Summit.